Former Secretary of State Madeleine Albright serves as the President of the Harry S. Truman Scholarship Foundation. 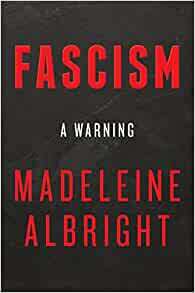 She is the author of several books, including, most recently, the #1 New York Times Bestseller, Fascism: A Warning. All attendees (except Saturday Only ticket holders) will receive a free, signed copy, sponsored by the Truman Council. Read more about Secretary Albright’s entire distinguished career. Jake Sullivan is a senior fellow and Master in Public Policy faculty member at the Carsey School of Public Policy at the University of New Hampshire. Sullivan is a senior fellow at the Carnegie Endowment for International Peace and Brady-Johnson Distinguished Practitioner in Grand Strategy at Yale University. He served in the Obama administration as national security adviser to Vice President Joe Biden and Director of Policy Planning at the U.S. Department of State, as well as deputy chief of staff to Secretary of State Hillary Clinton. Read more about his accomplishments. Joshua A. Gordon, M.D., Ph.D., is the Director of the National Institute of Mental Health, one of the National Institutes of Health within the U.S. Department of Health & Human Services. Appointed in 2016, he leads the federal agency for research on mental disorders. He is a former assistant professor in the Department of Psychiatry at Columbia University, and former associate director of the Columbia University/New York State Psychiatric Institute Adult Psychiatry Residency Program. Read more about his accomplishments.